Writing a business plan is no easy task — it can be painstaking. If you’ve ever written one, you’re probably familiar with the many websites that offer those static business plan and projections templates and galleries. They can be a great point of reference, but oftentimes they’re just that. Cynthia McCahon founded Enloop because she wanted to build a better resource for entrepreneurs gritting their teeth over their business plans, and because she’d watched many friends and colleagues sink time and money into business ideas that just weren’t going anywhere. Hoping to take a bit of the emotion out of an emotional process, Enloop was founded as a way for entrepreneurs to create business plans from scratch, guide them through the business plan process, and offer a system that provides thorough and intelligent risk analysis to give founders a sense of whether or not they’re off on the right track. Enloop’s solution is free and easy to use and automates the business plan process, because many first-time entrepreneurs just aren’t sure what to say to investors or underwriters — or how to say it. The startup’s patented system, created by MBAs, accountants, and software developers, generates the basic text of the business plan, explaining each important section to you as you change your inputs, toy with different scenarios, while Enloop automatically updates the financial data in that text as you go. The solution also automatically creates customized financial forecasts for your business, like sales, profit and loss, cash flow, and balance sheets. 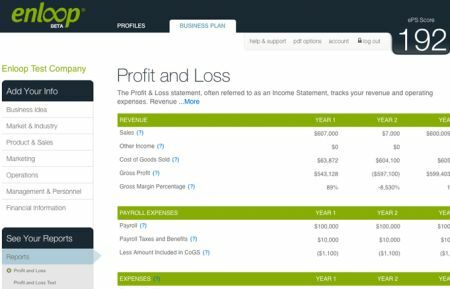 Entrepreneurs can start with creating a simple plan based on annual inputs, or generate more complex forecasts up to 3 year projections for CPAs and accountants. One simple plan is free, whereas three plans and 36-month projections will cost $10 per month, and unlimited will run $40 a month. But the real kicker is Enloop’s Performance Score (EPS), which is a FICO-style score for your business plan, which updates as you change your financial information, rising when it likes how you’re planning your business, and decreasing when you veer off the right path. The score is designed to be your devil’s advocate, your conscience — a safeguard against unstable or unworkable business plans in an attempt to save your business from the deadpool. Today, Enloop is also announcing some new functionality to go along with its business plan forecasting and “Klout score” for business plans, as it now allows your friends and colleagues to view and edit your plan(s). With any subscription, users can share the plan with as many people as they’d like (including their their CPA, business advisor or loan officer), and once invited collaborators can edit and print the plan, with the Enloop Performance Score changing in realtime. This is great, because you really don’t want business plan writing to be a solitary process, but at the same time, features like this are best offered for free. With Enloop generating a professionally formatted PDF document that’s ready to download, print, and share with any number of people that are critical to the process — it takes a lot of the pain out of having to string together the right words to describe the thrust of your business for investors and beyond. And, with a predictive algorithm that offers you a reality check and a glimpse into whether or not you’re building the next Google — well, couple this with InDinero and I’d say you’ve got yourself one helluva deal.